On 12th December, 2010, the 14th Sanya International Wedding Festival opened in the End of the Earth Resort (Tianya Haijiao) in Sanya. 80 pairs of couple from home and abroad attended the event which will last until 17th December. These couples will exchange their promise of love in the End of the Earth Resort in a romantic atmosphere. 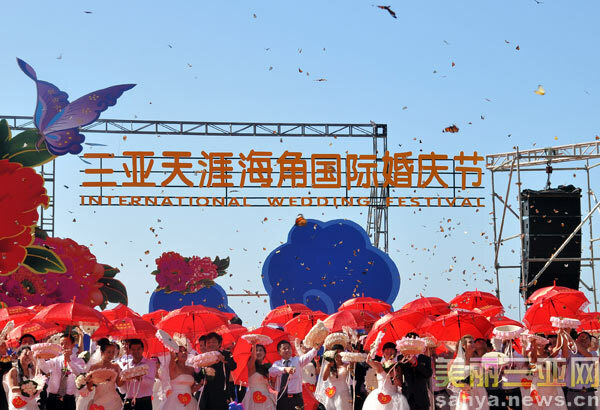 The Sanya International Wedding Festival is organized by the Sanya Municipal Government and co-hosted by the Municipal Committee Propaganda Department, Sanya Tourism Bureau and other relevant departments. Since its debut in 1996, the Sanya International Wedding Festival has become one of the influential wedding theme-related events in China with its combination of large-scale wedding festival and honeymoon vacations.